This project, a diesel engine sound simulation from 1974, details how to create a realistic diesel sound simulation for a model train. The interesting part about this design is that there are no microcontrollers or ROMs or EEROMs in sight. It's all done with discrete circuity and the only disadvantage of the project is that it will only work for one model on a track and you would have to alter it to operate with digital control of individual trains running at different speeds on the same track. For a more complex system you would want to allow different types of trains on the same track but as far as it goes it does the job well. It is also a good study in designing with transistors and the resulting design can be fitted inside a model train. A simulator for mounting in a model diesel train engine. Sounds are emitted representative of a regular diesel train. In the field of model trains much has been done to make such trains exact replicas of the larger full-size counterparts which they represent. In that regard sound simulators have been made to represent the sounds normally made by the engines or power units of such trains. However, prior devices have not accurately duplicated the various sounds of trains, particularly those of the diesel type. In a diesel train engine, the primary sound generated is a result of both the diesel motor exhaust and the turbocharger used to supply the fuel to the engine. For instance, when acceleration of a diesel engine is initiated, a lower frequency sound will result first due to the diesel motor speeding up. This first sound will gradually be followed by the sound of the engine turbocharger gaining speed. During deceleration the diesel motor exhaust noise will gradually reduce in frequency and loudness directly proportional to the speed of the engine while the sound frequency of the turbocharger will reduce at a slower rate. Thus there are several effects which must be taken into consideration in the generation of a true sound of a diesel train engine. It is the purpose of this design to faithfully duplicate the sound of a diesel train engine, and particularly as the engine is accelerated and decelerated through the various speed ranges and operated under the various conditions which a normal train operates. FIG. 2 shows graphically the usual frequencies generated by a diesel train engine as it accelerates, operates at a constant velocity, and decelerates. For instance it has been learned that the sound emanating from a diesel train engine is primarily the result of two sound generators, namely the turbocharger and the diesel motor itself. Studies have further shown that during an acceleration stage the diesel motor sound is somewhat directly proportional to the speed the engine is traveling. That is, the faster the speed, the higher the frequency of the motor exhaust sound. One other phenomena has also been learned in accordance with the present design. The turbocharger is the other primary sound generator for the train system and generates a sound frequency generally but not directly proportional to velocity. In other words, there is a time lag before the turbocharger sound frequency reaches a higher value on acceleration, and also a time lag before the turbocharger sound reduces in frequency during deceleration. During the period of constant velocity the motor and turbocharger sounds remain at a somewhat constant frequency relationship. In accordance with one embodiment of the design there is shown in FIG. 1 a sound generating system which closely approximates that of a full-scale diesel train engine but which can be embodied in components of sufficiently small size to fit into a model train package. Therein is shown the controller 20 which usually is a hand actuated rheostat including a resistor 21 with a sliding contact 22 for picking off the power setting or voltage to operate the train at the desired velocity. Thus the conductor 24 is adapted to be connected to one track 23a and the other track 23b is grounded. The track voltage from the controller is picked up through the model locomotive wheels to turn the motor which moves the train, the voltage also is fed through a rectifier 25 generally of the full wave type which permits such a controller to be utilized from either an AC or plus or minus DC power supply. 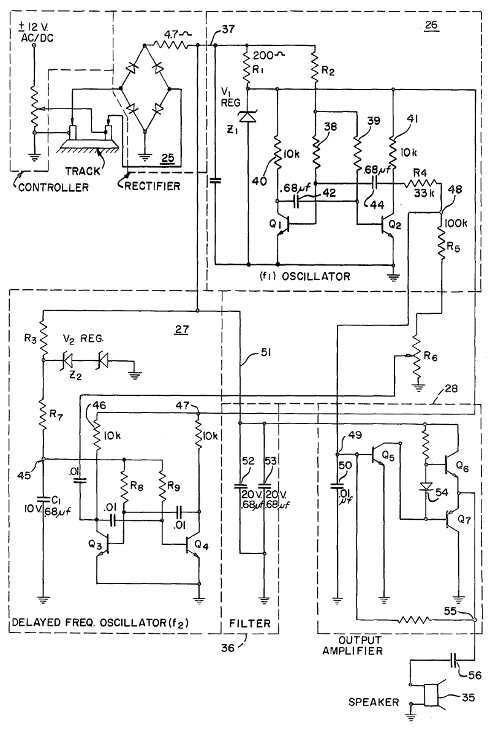 The rectifier supplies DC power to a pair of oscillators 26 and 27, with the oscillator 26 being provided to supply the signal f1 which generally approximates that of a diesel motor. The oscillator is of the type which emits a signal varying with the amplitude of the voltage supplied to input terminals. The controller output is also fed to the oscillator 27 supplying the turbocharger sound signal f2. 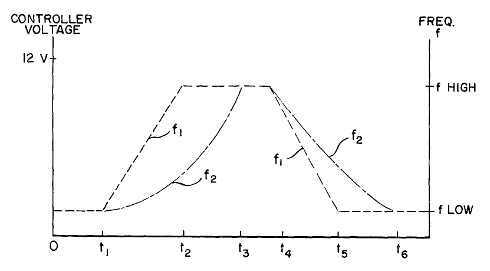 The signal f2 varies on a delayed basis relative to the supply voltage supplied because a capacitor C1 shown schematically delays the input signal sufficiently for the generation of an approximation of a turbocharger sound relative to the diesel motor. The full details of the operation of these oscillators will be described hereinafter. Thus the outputs of the oscillators 26 and 27 are fed through the resistors R4 and R5 and R6, respectively, for summation of the signals for the generation of an output signal which is subsequently fed to the operating amplifier 28. The resistor R6 is shown to be variable for purposes of adjusting the loudness of the turbocharger to represent the many different types of diesel engines. The rectifier output is also fed through the conductors 29 and 30 to the amplifier 28 for controlling the amplifier output level. 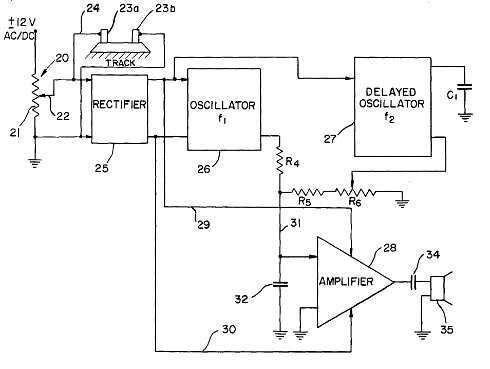 The oscillator signals are fed through the conductor 31 to the amplifier with a filter capacitor 32 connecting that conductor to ground for the purposes of limiting the frequency response of the amplifier to prevent oscillations. Thus the signal supplied from the amplifier 28 has an amplitude depending upon the setting of the controller 20 with a frequency output dependent upon the combined output signals from the oscillators 26 and 27. This amplifier signal is fed through an isolation capacitor 34 to eliminate any DC signal component and thereafter to a speaker 35 which is located in the model train. Thus it can be seen that both signals, i.e., the turbocharger sound signal and the diesel motor sound signal, are supplied to the speaker for approximation of the diesel train sound. Illustrated in FIG. 3 is a schematic drawing of the block diagram just described showing the controller 20, the rectifier 25, the oscillator 26 for the signal f1, the oscillator 27 for the signal f2, a filter 36 and an amplifier 28 having the output connected to the speaker 35. The output from the controller is fed through the full wave rectifier 25 and through the conductor 37 to the oscillator 26. This voltage signal is passed through the resistor R1 to the resistor 38 and resistor 39 connected to the bases respectively of the transistors Q1 and Q2. A V1 regulator comprising the resistor R1 and the zener diode Z1 is supplied for clamping the maximum voltage which can be impressed across these transistors. The collector voltages for the transistors Q1 and Q2 are supplied through the resistors 40 and 41 respectively. The transistor emitters are connected to ground and there is supplied a connection from each collector to the base of the opposite transistor including the capacitors 42 and 44 respectively. The transistors Q1 and Q2 conduct alternately. Thus the oscillator operates in the standard manner such that as each transistor turns on it in turn drops the base voltage of the other transistor sufficiently to turn it off. The frequency of oscillation depends upon the voltage supplied through the conductor 37. However a peak voltage is determined by the breakdown voltage of the regulator V1 which in turn is set by the breakdown voltage of the zener diode Z1. Thus it can be seen that the oscillator 26 supplies an output signal directly proportional to the input voltage received through the rectifier from the controller. Generally this output signal is in the range of 25 to 100 cycles per second to approximate the sound of a diesel motor exhaust. The oscillator 27 receives also the output signal from the rectifier 25. This signal is fed through the resistor R3 and R7 to the juncture 45. However also connected between this junction and ground is the capacitor C1 which, in the example shown, is a 68 microfarad 10 volt capacitor. This capacitor serves to delay sufficiently the voltage signal, and therefore the reaction, of the oscillator 27 to supply the delayed frequency signal necessary for approximation of the turbocharger sound. In the same manner as described with respect to the oscillator 26, the oscillator 27 receives from the juncture 45 a base voltage signal for a pair of transistors Q3 and Q4. Similarly the transistor collector voltages are supplied through the resistors 46 and 47 with the emitters being connected to ground as in the previous embodiment. Thus, this oscillator functions in exactly the same manner as the previous oscillator with the exception that there is a time delay in frequency buildup as the voltage signal supplied increases due to the effect of the capacitor C1. The frequency of this signal is in the order of 2,000 to 5,000 cycles per second to approximate the sound of a turbocharger for a diesel train engine. As previously described, the output from the oscillator 27 is supplied through the resistor R6 and R5 to the juncture 48 which receives also through the resistor R4 the output from the oscillator 26. The resultant signal is fed to the juncture 49 having connected thereto a capacitor 50 leading to ground. The amplifier 28 amplifies this signal with an output level dependent upon the voltage output supplied thereto by the rectifier 25. The rectifier output voltage is supplied through the conductor 51 which connects with the filter 36 including a pair of capacitors 52 and 53 which serve to smooth out the rectified power signal which may have a rather large ripple voltage due to the output signal from the track power source 20. Otherwise such a ripple signal might result in an unwanted modulation of the output signal in the audio range which is discernible to the human ear. Thus the rectifier output signal is supplied to the collector of the transistor Q6 having the base thereof connected through the diode 54 to the collector of the transistor Q5. The emitter is likewise connected to the output terminal 55 and to the emitter of the transistor Q7, while Q7 collector is connected to ground. Thus in the manner described the amplifier 28 has a voltage output swing dependent upon the voltage output signal from the rectifier 25 for amplification of the resulting signal derived from the addition of the oscillator output signals at the juncture 48. This signal is fed through a capacitor 56 for the elimination of any DC component to excite the speaker 35. The loudness of the speaker output signal is dependent on the voltage swing of the amplifier 28 which in turn is dependent on the amplitude of the voltage output signal from the controller 20. Thus it can be seen that the foregoing described circuit functions in a manner to supply a pair of oscillator signals, one delayed relative to the other but both dependent in frequency upon the voltage of the controller output, and dependent also in volume on the voltage of the output from the controller. In this manner a diesel train engine sound is provided which varies in loudness on the power supplied to the engine, and varies in frequency responsive to the mode of operation of the engine, i.e., the velocity of the train and whether it is accelerating or decelerating.